You Don’t Need 4 Lights to Get 4 Colors! Blue, green, red, white. Can’t decide what color to choose? 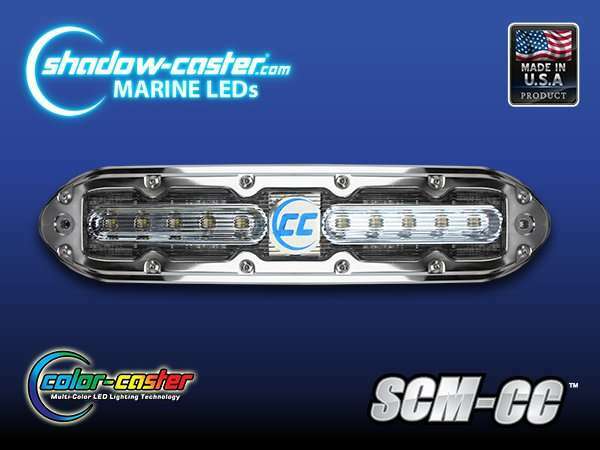 Shadow-Caster’s SCM-CC Color Changing Underwater LED Lights gives you all 4 in 1 light! The SCM-CC is a color changing, 3100 lumens LED underwater light that gives you four colors in one light. Made from long-lasting 316 stainless steel, the lights will never corrode or pit. Even in saltwater! Built-in electronics protect the light from voltage spikes, overheating, or from being wired backward. The LED’s will shine brightly for the lifetime of your boat. Best of all they are proudly Made in the USA! On the water, the fish will follow you! Bass, crappie, salmon, deep ocean pelagics. It doesn’t matter. The 10 LEDs flood the water with light attracting fish from all around. Green, blue, and white draw the most fish. But with all three available, why not experiment to find out what works best for you! At the dock, everybody will know which boat is yours. Your boat will never blend in at the dock again. Change colors to suit your mood. Have friends over for an adult beverage. Or dim the lights to spend a romantic evening watching the stars with your first mate. Want to really impress the locals? Make the lights strobe, fade, flash, or chase with the flip of a switch. There are two ways to control SCM-10 CC lights. Through the power toggle/push button switch. Through a Shadow-Net enabled Controller. 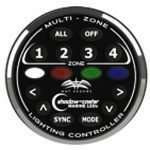 You control everything from the helm with the power toggle/push button switch that comes with your lights. Turn the lights on and off, change colors, dim them, or make them strobe, fade, flash, or chase. Learn more about operating the SCM-CC through the power toggle/pushbutton switch HERE.